Enter your [User code] and push the [#] key. This will silence the bell/siren and disarm the system. The red ZONE lights on the keypad will flash fast to help you remember where the violations occurred. Clear the alarm memory and red ZONE lights by pushing the [*] key, entering the digit , then pushing the [#] key. Faulted zones must be cleared or bypassed before the system can be armed. If programmed, the red ZONE lights will automatically turn off after five minutes (as a security measure). Pressing any key on the keypad will turn the ZONE lights back on. Your User code is four digits long. Don’t pause for more than 5 seconds while entering the digits or the control panel will reject your User code. If you make a mistake while entering your User code, the keypad will beep five times. After the fifth beep, enter your User code again. Make sure the red ARM light comes on. Exit through any TIME DELAY DOOR within EXIT DELAY. The AUTO HOME ARMING option enables the system to automatically bypass interior zones if you arm the system but do not leave the premises. The perimeter zones will be armed and the entry delay will remain intact. With this option installed, arm the system (enter your [User Code] and push the [#] key). If you do not exit before the exit delay time expires, the system will automatically arm perimeter zones and bypass interior zones. If you exit through an exit delay door, the system will automatically arm interior and perimeter zones. The rest of the ARMING THE SYSTEM section explains how to bypass zones before arming the system, as well as certain arming options our installer can install. However, it’s important for you to remember that no matter how your system is programmed, you will always disarm it in the same way: enter your [User Code], then push the [#] key. Enter your [User code] (if required), push the [*] key, enter the digit , then push the [#] key. Home Arming or bypassing interior zones will allow you to move about freely inside the premises while the system is armed. Refer to the next three sections: HOME ARMING, INSTANT HOME ARMING, and BYPASSING ZONES. Home Arming arms perimeter zones, while bypassing interior zones. The red ARM light will be on while the system is armed. The red ZONE light (s) of bypassed zones will flash slowly. You can enter the premises without setting off an alarm through any time delay entry. Instant Home Arming arms the perimeter zones and bypasses interior zones. Entry time delays are converted to INSTANT. Enter your [User code] (if required), push the [*] key, enter the digit , the digit , then push the [#] key. NOTE: System programming determines which User codes can bypass zones, also which zones can be bypassed. Enter your [User code] (if required) Push the [*] key, enter the digit , enter the zone to be bypassed, then push the [#] key. Push the (Home) Key, enter the zone to be bypassed, then push the [#] key. To indicate that zones are bypassed, the zone LED for the bypassed zone will flash slowly. NOTE: Zones can be also be bypassed by remote programming. When remote programming is used, the system can either be armed or disarmed. The procedures for adding a bypass and removing a bypass are identical. Enter your [User code], push the [*] key, enter the digit , enter the zone from which the bypass is to be removed, then push the [#] key. Push the (Home) Key, enter the zone from which the bypass is to be removed, then push the [#] key. 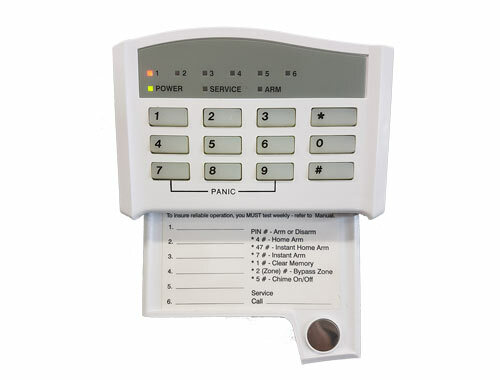 NOTE: Disarming your alarm system REMOVES all bypasses. If any zone other than a 24-hour zone is faulted (open window, malfunctioning sensor, etc. ), your system will not arm. You will not be able to arm the system until the faulted zone is cleared or manually bypassed. Any zone (except for 24-hour zones) that is violated during the EXIT DELAY time will automatically be bypassed until the system is disarmed. Warning: bypassed zones are not protected. If this option is installed, the exit delay will be eliminated when arming your system using Instant Arming, Home Arming, or Instant Home Arming. Enter only through a TIME DELAY door.If the ENTRY PRE-ALARM option is installed, the keypad will sound constantly until 10 seconds before the delay time expires (or the panel is disarmed), then beep rapidly for the last 10 seconds. Enter your [User Code] within the entry delay and push the [#] key. If the ARM light does not go off, wait for the keypad to beep five times, then enter your User code again. The keypad will beep twice to confirm that the system has been disarmed. Push the [*] key, enter the digit ,then push the [#] key. User 1 (master code) can use his code to change the code of Users 1 – 6. Enter your [Master Code], push the [*] key, enter the digit , then push the [#] key. The READY, SERVICE, and ARM lights will flash slowly. Enter the User number (1 – 6), and push the [#] key. Enter the new [User Code] and push the [#] key. The new code must be four digits long. Enter the new [User code] again and push the [#] key. If the new code is accepted, the keypad will beep twice. If you make a mistake while programming, or if the system rejects the new code, the keypad will beep five times. Try again. If no key is pressed for 5 minutes, the system will automatically exit the programming mode. Exit the programming mode by pushing the [*] key, then the [#] key. Make sure the new code works. After leaving the programming mode, Arm and Disarm your system to ensure that the new User code functions properly. User 1 can use his [Master Code] to delete the code of Users (2 – 6). Follow steps 1 through 4 for Changing a User Code. In steps 3 and 4 enter     in place of a new Code. When this option is installed, holding down the Police key for three seconds will trigger an alarm. The keypad will beep twice to confirm the alarm condition. Push the [*] key, enter the digit , the digit , and push the [#] key. Once the keypad lights go out, the system will be ready for testing. Walk through the areas protected by motion sensors; open and close protected doors and windows. Each time a zone is faulted, its corresponding red ZONE light on the keypad will begin flashing, and the keypad will chime. The standby battery test takes 2 minutes. During the test, the POWER light will be off. If the battery is okay, the keypad will beep twice. If the battery is low or dead, the POWER light will flash slowly, the SERVICE light will be on steady, and the keypad will beep five times. If the test message was not successfully transmitted to the central station, the keypad will beep five times, and the SERVICE light will flash fast. 2 beeps (confirmation tones) System armed or disarmed.